Three real-world industrial scenarios have been designed as use cases for validation purposes of the mF2C architecture. 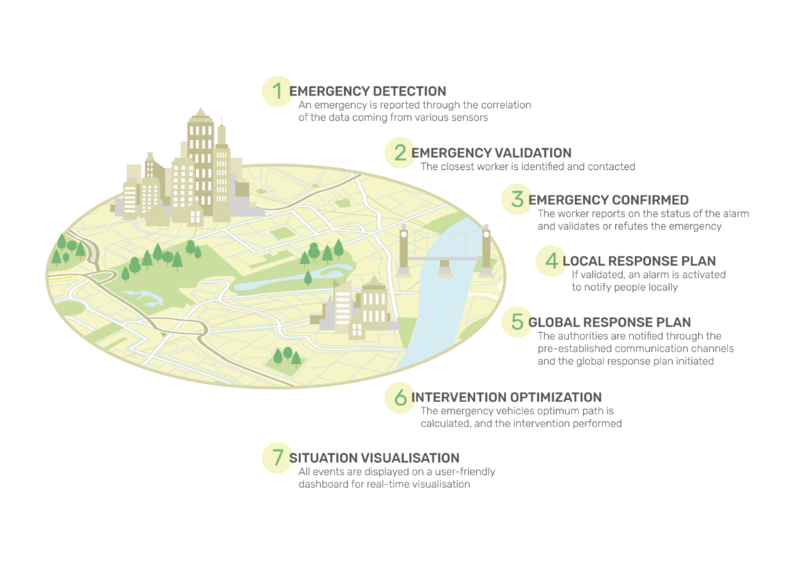 The first use case, led by Worldsensing, intends to explore the use of the mF2C technology in the context of smart/connected IoT and Industry 4.0 applications where continuous wireless communication takes place among different assets (autonomous or semi-autonomous) and the control centre, through a more efficient and flexible emergency management service. 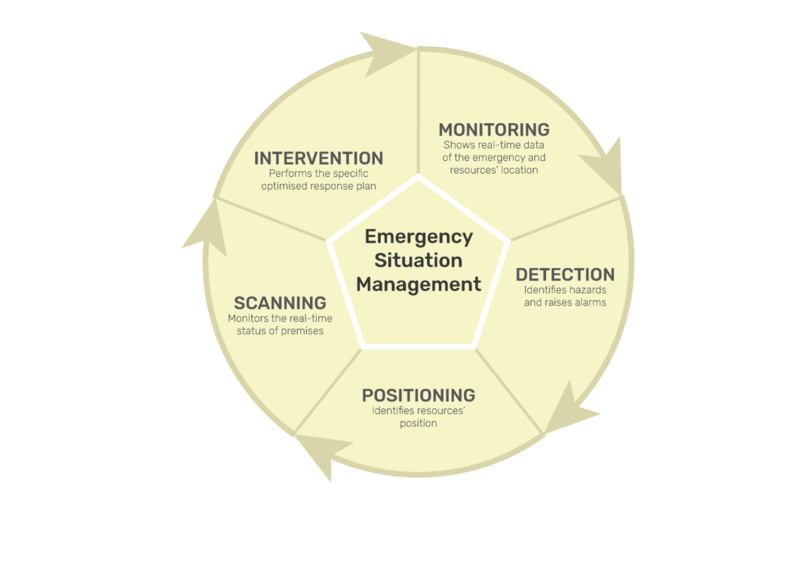 The Emergency Situation Management applies to the infrastructure construction and monitoring in Smart Cities. It will analyse the flow of assets within smart infrastructures to provide useful information to infrastructure operators, detect potential emergency scenarios in a real-time approach and decrease the necessary resources in terms of energy, latency, etc. to efficiently respond to these situations in accordance to the applications’ requirements. Monitoring: The monitoring has to be able to show real-time data of the emergencies and the location of the closest worker when relevant. Detection: The detection functionality is responsible for handling the inclination data as well as for raising an alarm when the threshold is reached. Positioning: The construction workers will be equipped with location devices. This position will be used to identify which construction workers are closest to the emergency being reported so they can be contacted to check what is really happening and report their diagnostic to validate or disprove the alert. Intervention: The intervention functionality corresponds to the intervention of the closest construction worker intervention reaction and also to the emergency vehicle path calculation, intervention, and the action on the traffic lights for clearance of the “green corridor” to optimise their intervention time. The storyline of the use case for IT-2 is as follows: the location of construction workers can be displayed on dashboard and maps and stored for use in the event of an emergency. Both these cases are evaluated to ensure compliance with the GDPR. The tiltmeter (also proprietary sensor) regularly sends data to the Gateway, that forwards it to the Monitoring Software, which shows the data on the dashboard and maps. Meanwhile, a jammer detector is idle. Once the Monitoring Software detects that a tiltmeter threshold was exceeded, the response plan is activated. First, the sirens are started. Then, the closest worker or actor of the use case is identified through the location information stored previously. He is contacted, so he or she can go and check the emergency. He or she will then report to confirm or cancel the emergency. The authorities and the relevant actors are alerted, and the alerts visualized on the dashboard and maps in real time. The warnings are emitted, and the emergency vehicles are sent, through the optimum path calculated at that moment. Finally, the traffic lights are changed to green on the path of the emergency vehicles in order to optimise the intervention time. The supporting network architecture requires four layers and has been designed as follow: one cloud layer, two fog layers and the edge/IoT. In all Cloud and Fog layers, devices run the mF2C agent, whilst the lower layer only includes the sensors and location components. The key business requirements of Emergency Situation Management services are service reliability and quality of service. To be commercially relevant, the solution needs an availability close to hundred percent, and certainly must be resilient to failures, as not reporting an emergency can have fatal consequences. mF2C will increase the reliability by 30% and the Quality of Service by 10% while decreasing delays by 30% and Operational Expenses by 10%. Presentations of all three use cases using mF2C are available at the official mF2C YouTube channel, featuring an in-depth view into actual embodiments of the applications.